Osteria Menu See how quickly your restaurant will start making money online, thanks to the Osteria menu template! The minimalist template will make it easier for customers to place orders. Are you looking for the best WordPress menu? Osteria is a WordPress menu theme that will help you sell online. 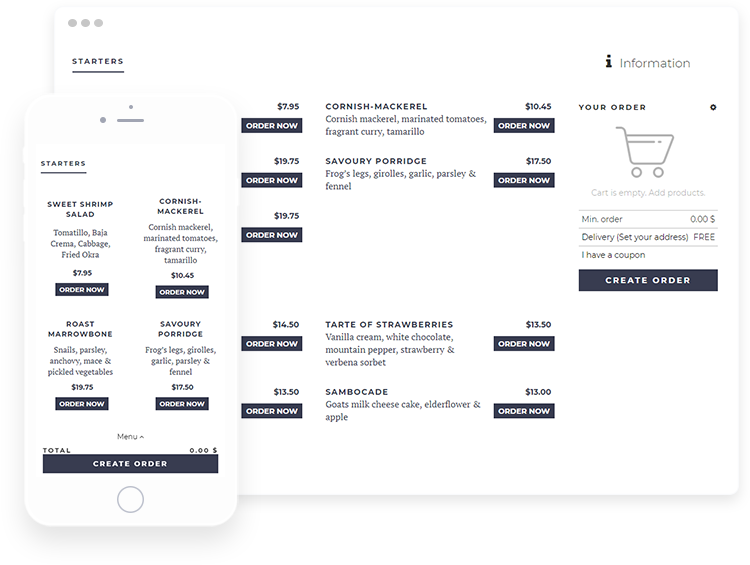 Use the UpMenu plugin to launch an online food ordering system on your restaurant website. Implementing a WordPress menu on your website is very easy to do and will take you just a few minutes. Then you will start earning on online orders. Minimalist look If you like minimalist formats, this WordPress menu theme is designed for you. You can easily match it to the style of your restaurant by choosing appropriate colours. Suitable for every type of cuisine Whether you run a sushi restaurant or a pizzeria, the Osteria WordPress template will adapt perfectly to your menu. It is able to do this thanks to an unique way of presenting the list of menu options. Intuitive online sales The stylish yet easy-to-navigate layout of the Osteria WordPress theme menu provides a very intuitive process for the customers using the system. It takes just a few clicks to select dishes and place an order to be picked up at the restaurant.